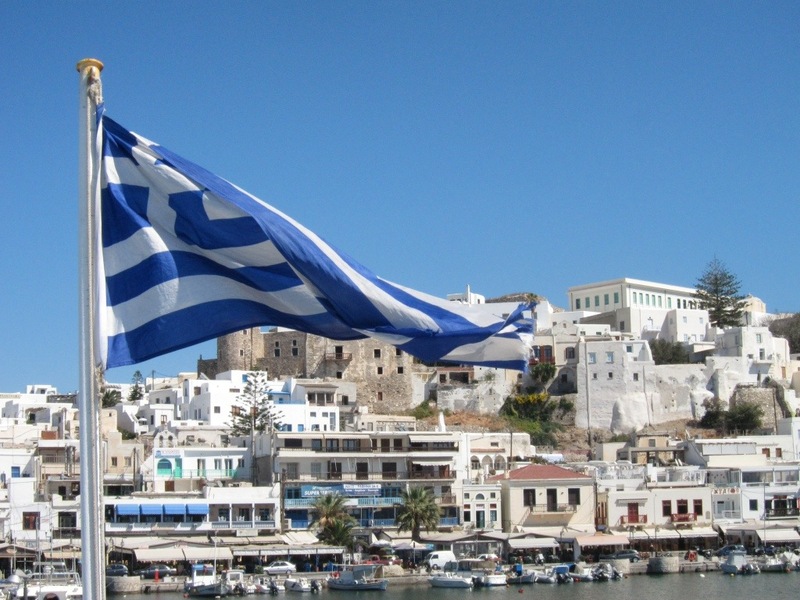 Yineka and I have just spent 2 nights in Parikia, the port town on the Cyclades island of Paros. We found a great little hotel, ‘The Argonauta’ just a few minutes walk away from the ferry jetty, and only 60 euros a night for a double room with cute little balcony overlooking the town square and the side street. We could have found much cheaper accomodation, but this place oozes style…only about 15 rooms, all on the second floor, and all leading off a delightful inner courtyard, where you can sit at the tables and have a glass of wine, a bite to eat etc. Very civilised. I’m writing this from the deck of Skopelitis Express, a small ferry boat that that daily goes from Naxos to all the little islands of the lesser Cyclades. Someone had a sense of humour, as our boat is far removed from any express service…more like the slow boat to China…but then again, what’s the hurry. ( That’s what the guy in the ‘ Micro Agora’ ( Mini-Market) said to Yineka-Mou one afternoon in Crete….”why are you in such a hurry madam, you have a train to catch…Siga Siga… Slowly, slowly”) so here we are Yineka-Mou and I , sitting up on the deck, just having eaten lunch, a Koriatiki Roll ( like a Greek salad in a fresh crusty roll) …and delicious. The great little ship ‘ Express Skopolitis’…. someone with a wicked sense of humour must have named her! 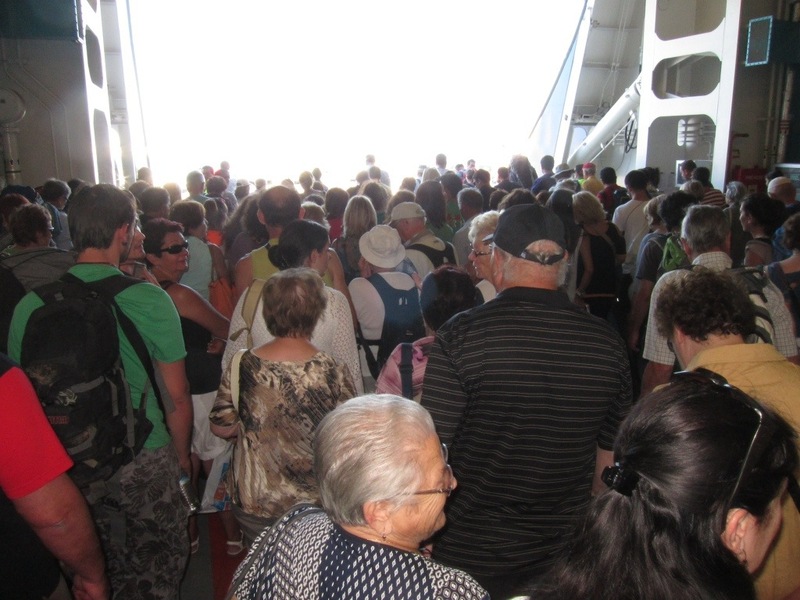 If you haven’t ever been on one of these big Greek ferry boats, its an experience not to be missed…organised chaos is the best way to describe it….actually, forget that I said that…disorganised chaos would be a more apt description . First, you queue up, with all your luggage, in what I call a ‘holding pen’…awaiting the arrival of the ferry. As soon as it arrives, the passengers disembarking stream off, closely followed by the cars, trucks, buses, motorbikes etc…as soon as this is underway, the authorities then open the gates to the holding pens, and all the embarking passengers then stream forward to mix with the incomers and the vehicles…there are still trucks rolling down the gangway ramp at the stern, mixing it with the hordes of people struggling to get on via the same ramps….it has to be seen to be believed, but somehow or other it works….and the ferry is turned around and on its way within minutes…. On the Car/Truck deck of Blue Star Paros, waiting to disembark in Naxos. ” is it your first or second wife ” he asked. We had to hurry back down the hill to the Jetty, but on the way stopped to pickup our lunch from the bakery ( the Koriatiki rolls) and also a couple of bottles of wine ( it could be a long trip on this express ferry) and we made it onboard with just minutes to spare before we set sail. At the moment we are sailing down the west coast of Naxos, heading for our first stop which I think is called Heraklia. After that, we have one more stop at Schinoussa, before we reach our final destination today at Nissi Koufonisi at about 4:40 pm. 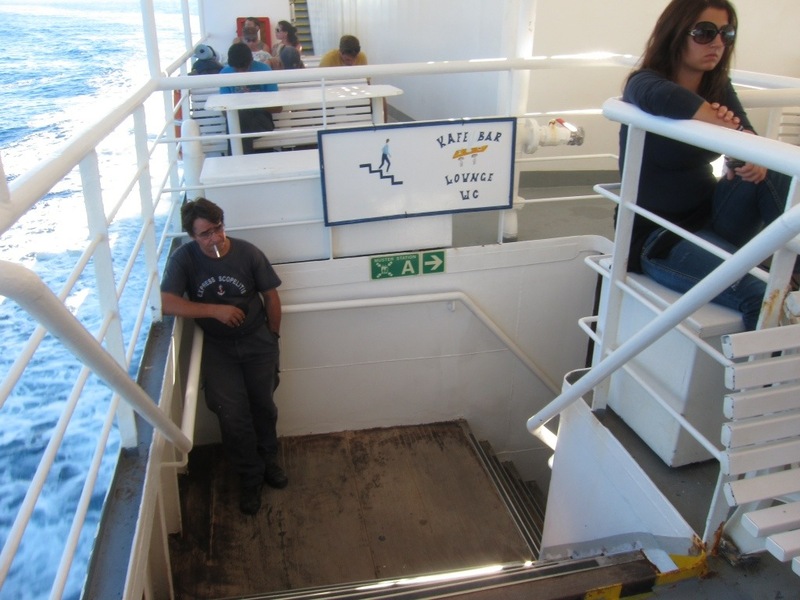 Aboard the SKOPOLITIS EXPRESS…… the slowest boat in the Aegean. Built in 1979, it says.